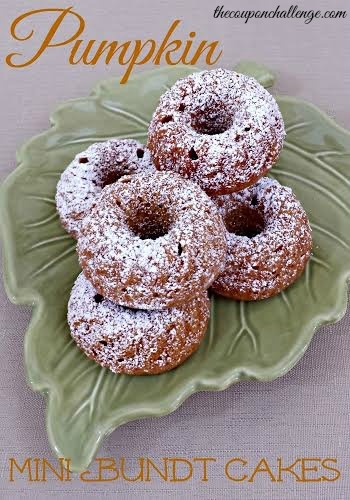 These Mini Pumpkin Bundt Cakes will make a great addition to any meal. 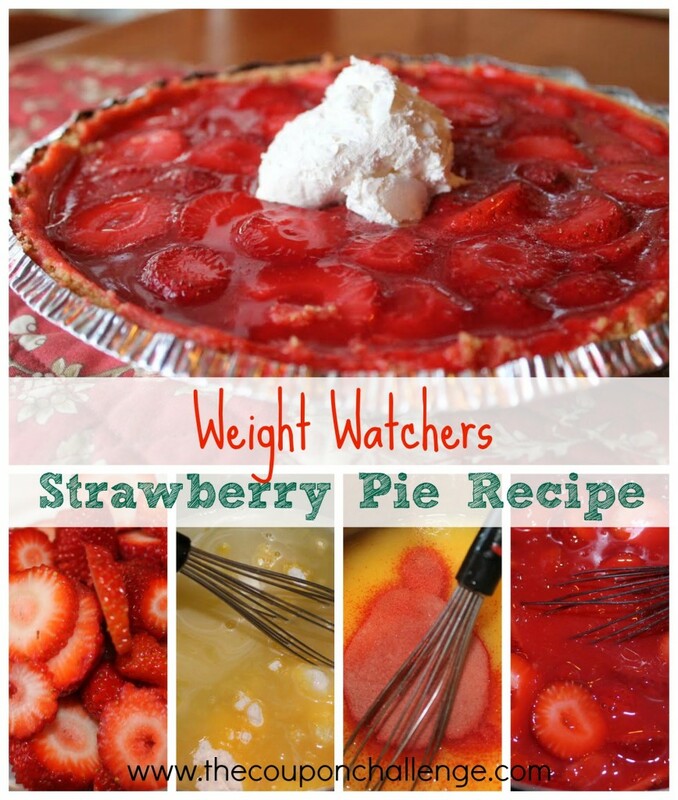 Watch for sales on canned pumpkin to make this dessert budget friendly. I’ve also made my own pumpkin puree, it’s just a bit more time consuming. You will likely have the other ingredients already on hand to make this pumpkin cake recipe – easy and delicious! Preheat the oven to 350-degrees and use a cooking spray to prepare your mini bundt cake pans. 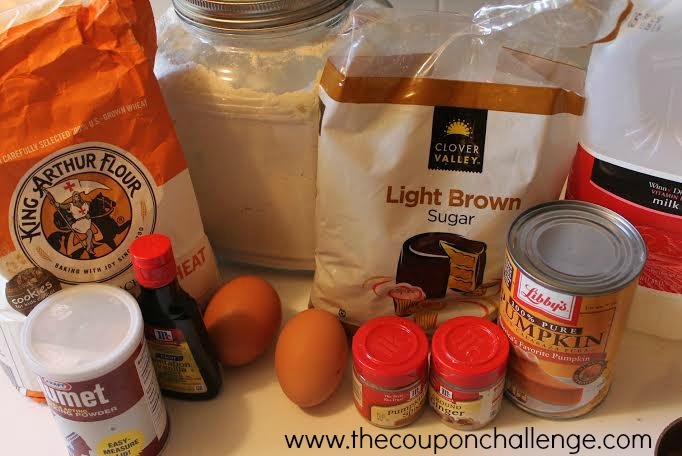 In a large mixing bowl, whisk together the flours, sugar, baking powder and soda, salt and pumpkin pie spice. In another bowl, beat the eggs, vanilla extract, cooled melted butter and apple sauce. Stir in the sour cream and the pumpkin puree. Fold in the dry ingredients until just combined – do not overmix. Pour the batter into the prepared pan and bake for 18-22 minutes until a toothpick tester comes out clean. Let the cakes rest 5 minutes, before turning them out onto a wire rack. Repeat with the remaining batter (depending on the size of your pan). Once cooled, use a flour sifter to dust the tops of the cakes with confectioners’ sugar. 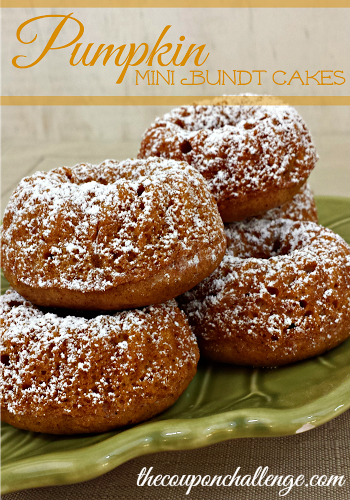 Now, try not to eat all of these mini pumpkin cakes by yourself! 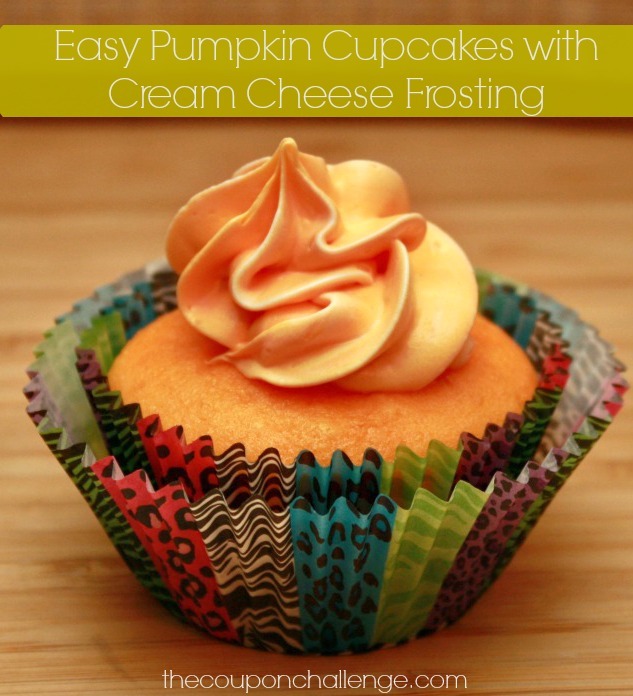 You may also like my Easy Pumpkin Cupcakes with Cream Cheese Frosting! I love the flavor of pumpkin, and I really like that it is so good for you – those two things don’t always go hand in hand. Pumpkin has fiber, antioxidants, beta carotene, iron, Vitamins A,C,K, and E. It makes for a great ingredient in many recipes, and it also keeps goodies moist instead of dry like many “healthy” recipes. These Weight Watchers Pumpkin Muffins come in at right about 4 PointsPlus per muffin. Line muffin tin with cupcake wrappers. 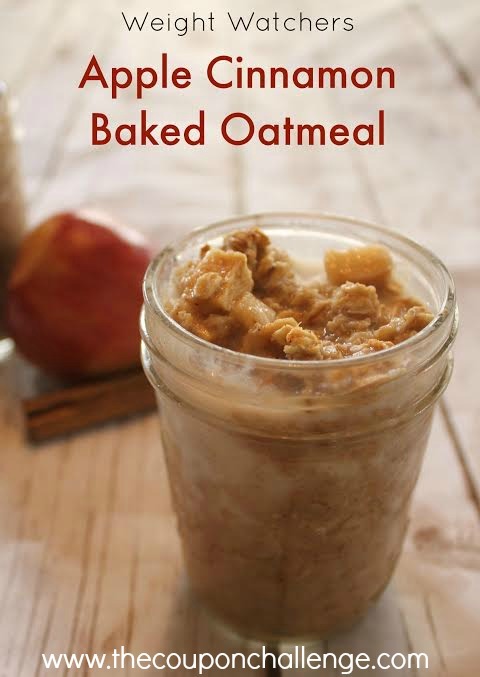 Beat applesauce, brown sugar, milk and eggs in a medium bowl until well combined. In a separate bowl stir together; flours, cinnamon, baking soda, and salt. Add flour mixture to wet ingredients a little at a time until fully incorporated. Fill wrappers 2/3 of the way full. Bake for 20-23 minutes, or until a toothpick comes out clean when poked in the center. Fill wrappers ⅔ of the way full. These muffins also freeze well, so they are great for double and triple batches. Toss into zippered freezer bags for grab and go breakfast or snacks. 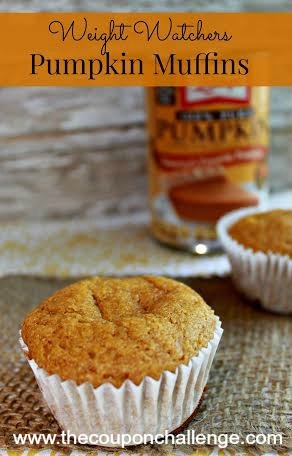 Share your thoughts on these Weight Watchers Pumpkin Muffins. Did you make any changes? 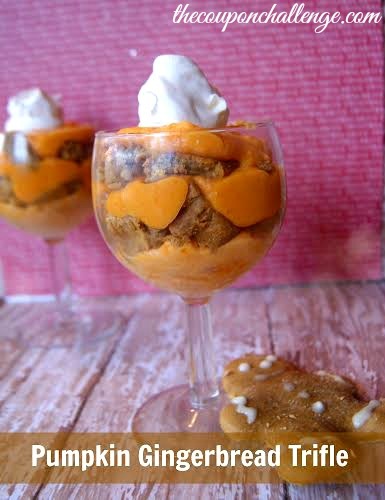 This Pumpkin Gingerbread Trifle is perfect for holiday entertaining. It’s a delicious holiday dessert that is simple to make, and beautiful to present to guests or even your family. 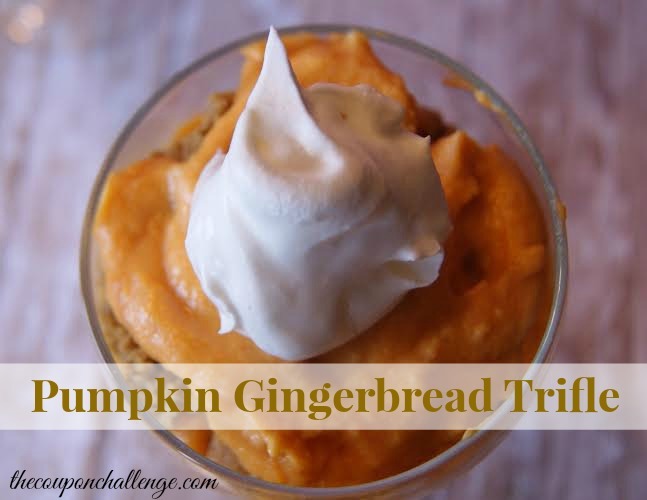 Layered with sweet, light pumpkin cream and spicy gingerbread, this dessert will be a hit and is a wonderful alternative to plain old pie. For individual servings this is beautiful in a wine glass, and equally pretty in a mason jar. Make it in a large glass bowl for a self serve dessert. 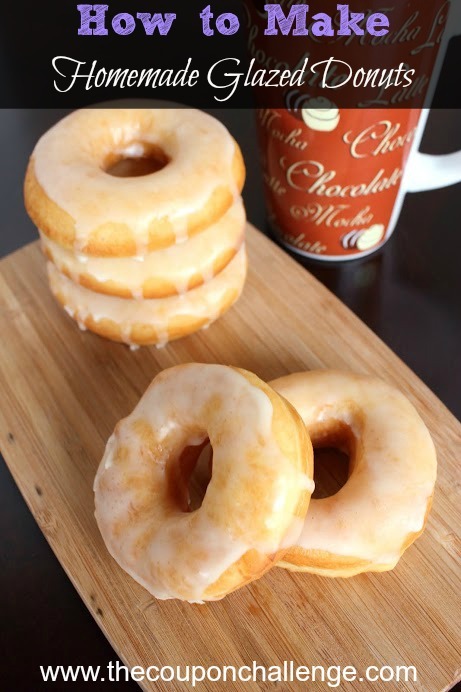 Customize it a bit to make it your own by layering in a chocolate drizzle instead of caramel. You could also whip instant coffee granules into your cool whip for a delicious coffee flavored topping. Bake gingerbread using THIS Soft Gingerbread Cookie Recipe, cut in half. Instead of cutting out shapes with cookie cutters – roll flat and bake like a large rectangle cookie, cool, and cut into 1×1 squares with a knife. OR. like me, you may have some gingerbread men left over already. This is a perfect way to use up broken or leftover men. Just crumble into small pieces. Layer pumpkin mixture, a drizzle of caramel, and gingerbread. Repeat. Top with plain cool whip. See more Gingerbread Cookie Recipe and Gingerbread Recipes! Get in the Fall spirit with these Easy Pumpkin Cupcakes. These would be great for a Fall party at school! Preheat oven to 350F. Line 24 muffin cups. Set aside. *Check out these cute Fall Leave Bake Cups. 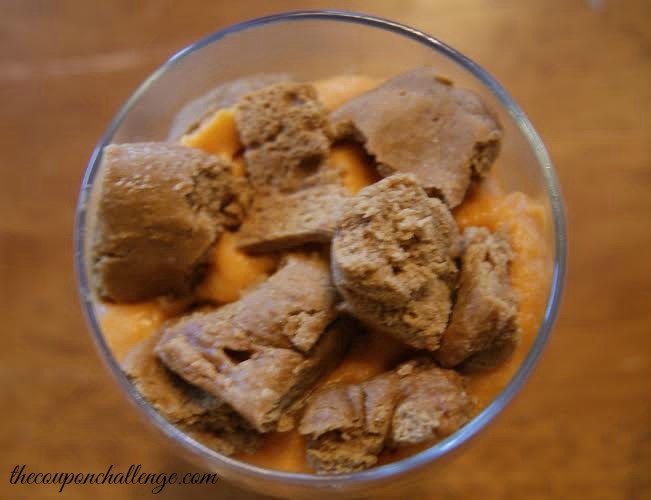 Blend together cake mix, pumpkin, eggs, oil, and water, with electric mixer. Beat on medium speed for about 2 minutes. Stir in chocolate chips if desired. Pour batter into prepared muffin cups, and bake for about 20 minutes or until a toothpick inserted comes out clean. Beat cream cheese and butter until fluffy. Add the confectioners’ sugar, vanilla and cinnamon and beat until smooth. Add a few drops orange food coloring (optional). I used Wilton’s 1M frosting tip to get the look in the photo above.